Surveys had shown that McDonaldland and its diverse characters were immensely popular with children, even though the commercials lasted only 30 and 60 seconds at a time. It was with this in mind that McDonald's Corporation created the playground concept. 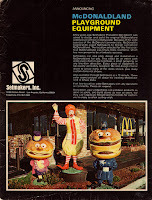 The restaurant chain wanted to provide an enjoyable play area where the children could identify with their favorite characters from McDonaldland. Since McDonaldland itself had been designed by Don Ament, a well-known designer of Hollywood sets and restaurants across the country and who just happened to be president of Setmakers, Inc., Setmakers was tasked with designing and producing a line of playground equipment that could be used to create these McDonaldland themed play areas envisioned by the corporation. 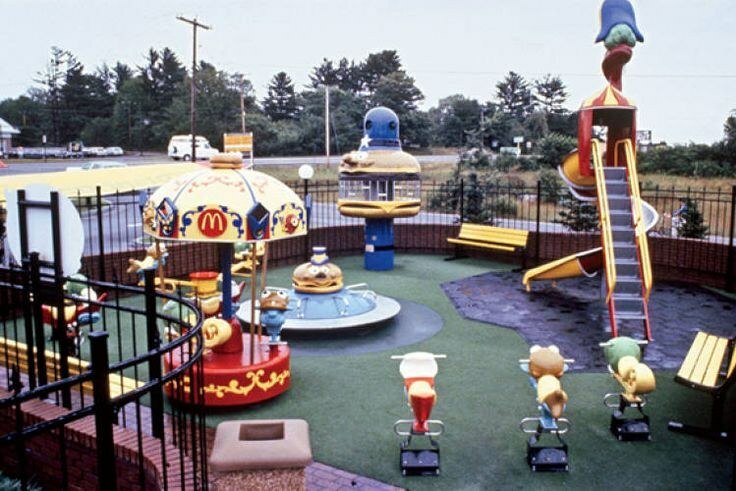 The 1972 Illinois State Fair in Springfield marked the national debut of McDonald Corporation's new "McDonaldland" playground equipment. McDonald's Corporation's participation in the Illinois State Fair was undertaken as a national test program. It was felt that the 10-day period would put the equipment through about three years of wear and tear. In addition, McDonald's wanted to see how the equipment would react to the heat. rain and wind that usually occurs during State Fair time. Of course, the playground passed all tests and the first permanent McDonaldland playground opened in the fall of 1972 at a McDonalds outlet in Chula Vista, California. The Chula Vista playground was almost double the size of the Springfield playground! To promote this new concept of McDonaldland Playgrounds, Setmakers, Inc. produced both a catalog and a 12 minute 16mm video (seen below) featuring the Chula Vista park. Soon afterwards, McDonaldland playgrounds featuring the brightly-colored equipment offered by Setmakers, began springing up all over the country. Read what it was like to play in one of these honest to goodness, outdoor, mess-around-and-you might-get-hurt, 1970's playgrounds at The Experience Project and at This article from AllDay.com.